Office Depot Gift Cards are a great choice for everyone from the classroom to the boardroom. Available in multiple denominations, they can be used to purchase thousands of products in stores across North America, by phone at 1.800.GO.DEPOT, or online anytime at officedepot.com. 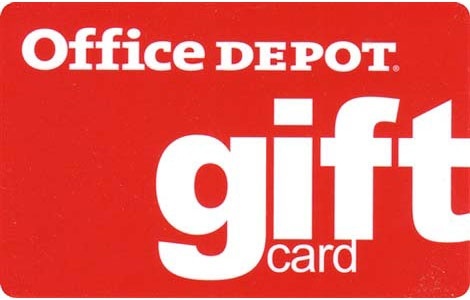 The Office Depot gift card is issued by North American Card and Coupon Services, LLC and is redeemable solely for merchandise (which excludes any type of prepaid gift, merchandise, debit or services card) at Office Depot stores, online or by phone. Purchases will be deducted from the card amount until the value of the card reaches zero. This card is not redeemable for cash, except as required by law, and cannot be used as a credit card or account payment. Please safeguard this card and treat it like cash. Your Office Depot register receipt will show the remaining balance on the card. Obtain balance at Office Depot stores, online at www.officedepot.com (www.officedepot.ca for Canada) or by calling 877.776.5056. Must call before using if more than 5 years elapse since funding. No expiration date or service fees apply. PLEASE NOTE: All plastic gift card sales are final and cannot be blocked, replaced, devalued, or refunded. Please treat these cards as cash.